So far we've covered general holiday safety from CDC/NIOSH and holiday stress management from CDC and Mayo Clinic. 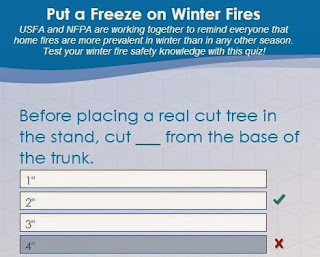 Now let's get down to the exciting stuff - fire safety. 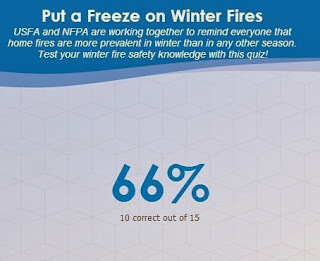 NFPA and FEMA infographic for the "Put a Freeze on Winter Holiday Fires" campaign. 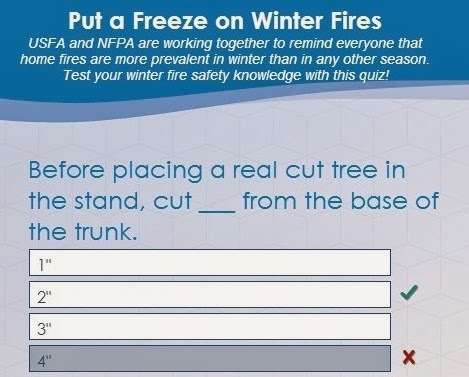 The Industrious Hygienist would also like to share the following HolidayFire Safety video from FEMA (although I'm still learning how to embed videos, so click the hyperlink if you want to watch it). 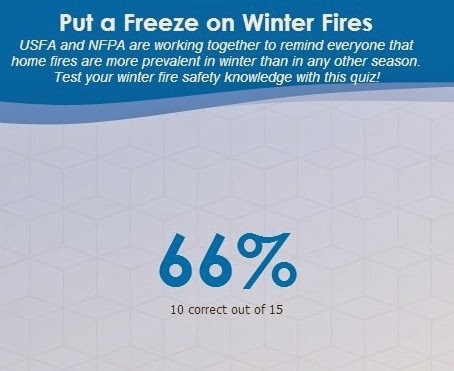 The Industrious Hygienist decided to take the NFPA "Put a Freeze on Winter Fires Quiz" and test her knowledge of winter fire safety. So I feel I should defend myself on some of the wrongly answered questions. See below. 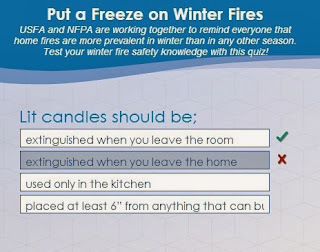 Lit candles should be extinguished when you leave the room. The place where the Industrious Hygienist currently lives (we don't feel it is right to call it a house) has a "great room" that consists of the entry, family/living room, dining area, and kitchen all encompassed, with a hallway leading down to the bedroom. 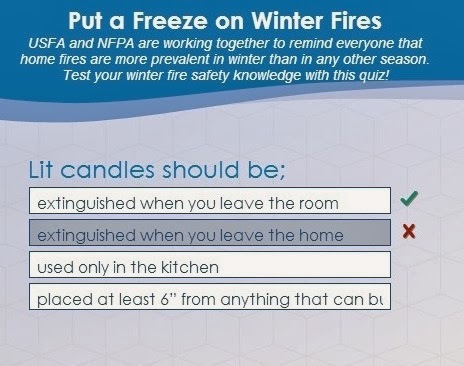 So if we light a candle, it is usually in the "great room" and therefore extinguished before we walk out the door and leave the home. Semantics. 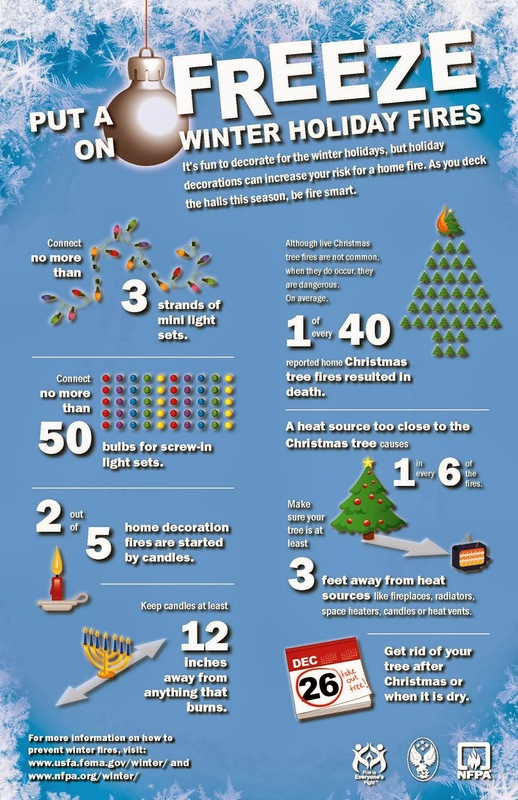 But probably useful information if you have a larger space to live in and lots of candles. 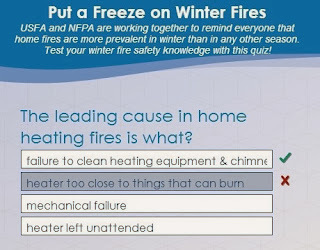 The leading cause of home fires is failure to clean heating equipment and chimneys before use. I've lived in Phoenix, AZ or Orange County, CA for most of her life and only recently moved to Prescott in beautiful Northern Arizona. So my exposure to cold weather has been limited - I've never lived anywhere with a chimney and never used a space heater before. Now I know that if I happen to move somewhere with a chimney, I should have preventative maintenance done on it. We never used our heater in Phoenix. I did have the furnace checked here in Prescott before it was turned on. Yay for me! 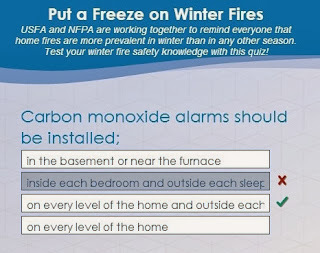 Carbon monoxide alarms should be installed on every level of the home and outside each sleeping space. Again, with the size of the place we live, we just have one CO monitor in a central location, equidistant from the gas-fired kitchen appliances, laundry room, and bedroom. This whole idea of a multi-level home is intriguing - I should try it sometime. :) Makes sense to have to CO monitor outside the bedrooms, since you'd want to know what the CO concentration is before it is in your sleeping space and you are susceptible to it. Just this week, a family in Breckenridge was exposed to high levels of CO and some of the family members were hospitalized. See news story here. Before placing a real cut tree ion the stand, cut 2" from the base of the trunk. I've never had a real Christmas tree before, we always had an artificial one. Since we got our Alaskan Malamute (Shadow), we haven't bothered to put up a tree the last three years. He likes to try and eat the ornaments. 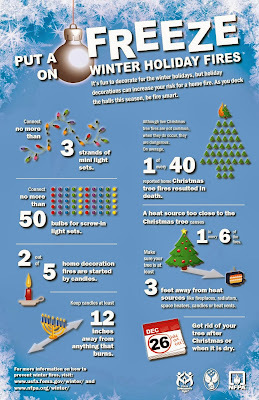 So I'll keep this in mind if I decide to ever use a real cut tree (not likely) for the holidays. Keep your eyes peeled (that's a weird/gross phrase I should never use again) for the Industrious Hygienist Holiday Card and end of year blog post!